Big companies tend to emphasize leadership skills, and for good reason—with a large workforce, you need multiple people taking the lead on smaller projects, distilling information to higher-ups and, according to conventional business wisdom, a few executives at the hierarchical top to make the biggest decisions of all. So what about small businesses? It would be an oversight to assume small business owners don’t need to cultivate the same leadership qualities that larger ones do. If anything, it’s even more important for small businesses to fill their teams with leaders because every employee carries that much more weight, responsibility and impact on a small business’s success. 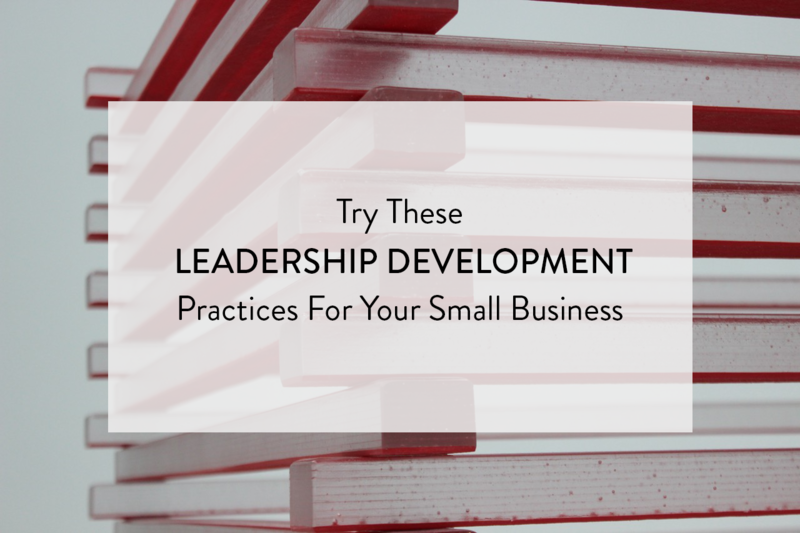 So if you’re looking for ways to encourage more leadership in your small business, try these four options. Company activities may seem frivolous, but honestly, fostering leadership skills (and team-building) is a necessity for the future of your small business. Rarely do adults get to build things with good ol’ glue and paper anymore. In this simple activity, you divide your employees into groups of three or four, and provide them with a host of different building materials—anything from popsicle sticks to straws, pencils, cardboard or paper. Then ask them to build the tallest possible tower in 20 minutes. You’ll be able to see immediately who takes a leadership role and who doesn’t, and how the group dynamic works in a different situation. After 20 minutes, you can choose a winner—the ones with the tallest tower, of course—and then dissect the game in a few ways. Why did that team win? How did leadership play into it? Did other teams fail because of a lack of leadership, or did too many people try to play the position? It’s one of these easy games that showcases people’s personalities clearly and adds a bit of fun to the office because inevitably towers will crumble, and you’ll all feel like you’re in fourth grade again. But in a good way. This is a bold one, but give it a shot… though maybe not on a busy day. The idea is to let people assume the jobs of their coworkers. Simple as that. We don’t recommend doing this all at once (it’s not ideal to have a company full of people who are suddenly frustrated at their first day on the job), but you should encourage the day’s job-rotators to ask their peers for help and guidance accomplishing a few easy tasks. This accomplishes two things: one, it works wonders for creating empathy in the workplace. Offices are rarely a space where anyone understands what the heck anyone else is getting paid for, and this will unquestionably help your employees feel more connected to your business, maybe even more invested, and certainly more knowledgeable. Secondly, that empathy can draw out leadership moments among people who rarely get the opportunity. A secretary may be often called upon to do menial tasks, but he might soar given the opportunity to instruct a clueless salesperson how the filing system works. It confirms for people that they’ve come a long way, intrinsically growing a skillset no one else has and proving themselves a valuable asset—all while providing opportunities to lead others during the day and build their own confidence. Here’s another classic activity: hand out some pieces of rope to groups of three or four, and tell them that they can’t say a word to anyone for the rest of the exercise. Then make them create shapes with the rope—a circle, square, star, etc. You can make the game progressively harder by having them create outlines of animals or more complex objects if you like, depending on whether you’ve got a long enough rope and the collective patience for poor art. This is another teamwork-builder that will show you exactly who emerges as a leader and how. But this also offers a nice bonus that the tower-building activity does not: it adds miscommunication as an obstacle to overcome, and you can chat afterward about how that lack of clear communication helped or hindered their project. The easiest way to build leadership in a small business is simply to give your team more authority. Put them in charge of new projects, have them brainstorm ideas they think might work and allow them to take point, accepting responsibility for the outcome—good or bad. This works in trial scenarios or with smaller initiatives, but if they go well and your employees prove themselves, then it follows that you can reward them with more ambitious projects that will ultimately help both your small business and their leadership skills. Sometimes people already have the qualities of being a great leader, and just haven’t been given the chance to showcase that. One of the best aspects of working for a small business is being able to communicate with employees and give them opportunities that more rigid top-down institutions can’t. Couple these techniques with our favorite small business blogs, and the possibilities present themselves. Take a few risks and have a little fun. You’ve got the room to do it.